As the series progresses, Shane’s character takes a dark and mysterious turn. While his general outlook on the world (or what’s left of it) may have changed, his accessories and weapons stay consistent. ​Shane is known to carry quite a few different weapons and accessories throughout the course of the show. This doesn’t really come as a surprise considering his background in law enforcement. This chain with the “22” pendant is his signature jewelry artifact. ​This often overlooked item is minor, but it could really put your Shane Walsh get-up over-the-top! ​This Sterling Silver neck-chain on Amazon is nearly an exact match to Shane’s chain. ​Over on ebay there’s a merchant who will make personalized number pendants. If you need one, all you have to do is purchase one and specify the number “22” when ordering. Check it out right here. Shane’s gloves are probably most memorable from the shootout scene in season one episode one. The same shootout where Rick is injured requiring hospitalization. Shane’s gloves are high quality black tactical style gloves. ​Sources indicate that these Franklin tactical gloves are the same model gloves Jon Bernthal wore while portraying Shane Walsh. Shane has at least two different belt looks. The first is from season one episode one; while in full uniform, he employs a military style belt equipped with all sorts of tactical gear. Shane’s other belt is pretty basic on it’s own. It’s just a normal black leather belt. ​Here is a link to an excellent tactical belt if that’s the specific Shane look that you are going for. ​Also here is a link to a quality plain Calvin Klein black leather belt that is nearly identical to Shane’s. Shane always has his pistol at his side, and he employs a tactical black holster. This UTG belt holster is almost an exact match to the one he wears on The Walking Dead. Shane’s watch only makes a brief appearance in season one. It appears to be a black military style analog watch. ​No Sheriff Shane Walsh costume would be complete without this contemporary Timex timepiece. Throughout the series, Shane Walsh is documented to use quite a few different weapons, but one that he has with him at all times is his trusty sidearm. A Glock 17. ​For obvious reasons it makes more sense to equip yourself with less lethal firearms when putting together an accurate costume. Assuming you don’t intend to harm yourself and others, I have selected my top choices in replica airsoft guns that best match the weapons used by Shane Walsh. ​This airsoft pistol matches Shane’s Glock 17 to almost every detail. 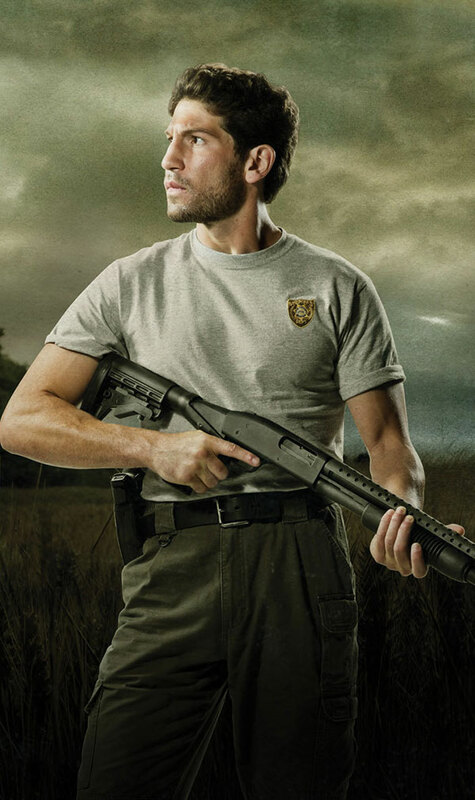 Shane has been documented using at least two different shotguns throughout the course of his time on the show. In fact it seems to me like he must be surgically attached to his shotguns because he does not go far without them. He's known to use a Mossberg 590 shotgun and apparently a Remington 870 shotgun. Though technically he never really used the Remington. During the Woodbury extraction, Rick hallucinates seeing a bearded Shane carrying the Remington. ​This airsoft rifle closely resemble the Mossberg 590. Here’s where you can find one should you be inclined to purchase one for yourself. 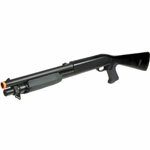 ​This airsoft was seemingly built to resemble the Remington 870, and you can check it out for yourself here. ​Overall Shane Walsh has one of the most interesting and diverse selections of weapons and accessories that we have covered so far. Stay tuned to TVSG for even more exciting and entertaining guides to dressing and accessorizing like your favorite characters!